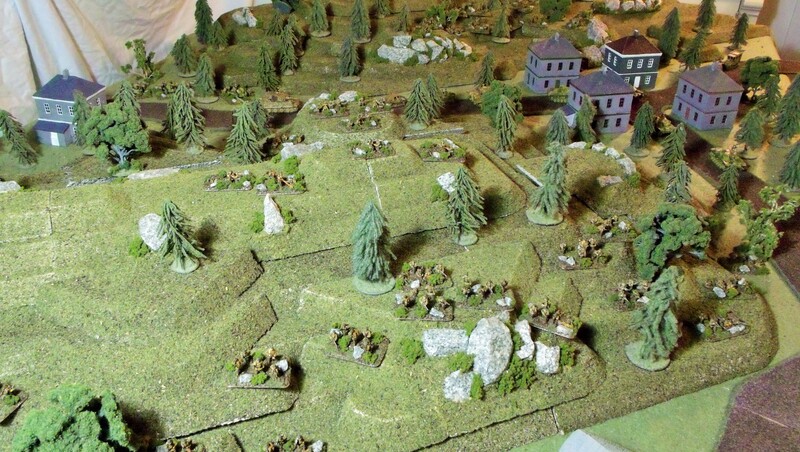 Hills are one of the basic staples of wargaming terrain. Easy and cheap to make, everybody has them! Mountains on the other hand are a different story. They require a lot more work to make, and are very difficult to make playable and realistic looking at the same time. If you decide to go with modular ones like we did then it becomes even harder. This system was the fastest, and easiest way we could come up with to make gaming mountains. Most modular mountains use a hex based system. We wanted to use something simpler that we could make ourselves without having to buy hex tiles. Our tiles are square one foot by one foot tiles that we were able to mass produce using a common table saw. A band saw would have been better (don’t have one unfortunately) or a table mounted hot wire would have also worked nicely. As long as you can get a consistent straight cut, it doesn’t really matter what tools or methods you decide to use. All three of these module types can be rearranged every game to create wildly different battlefields. The next few articles in this series will go into how we made these modular pieces so that you can do something similar yourself.